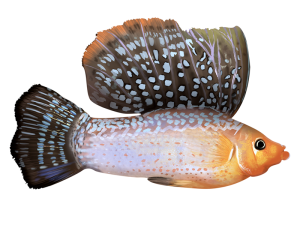 Molly (Poecilia Sphenops) originates from Argentina, Brazil, Africa, the U. S. Virgin Islands and Venezuela. Robert John Lechmere Guppy discovered Mollies in 1866. Mollies don’t lay eggs they give birth to living young. Molly fish are some of the most popular aquarium fish and most aquarium hobbyists have at one time at least had one of these attractive and gentle life bearers in their fish tanks. Mollies are tropical fish which are considered the best variety of fish for breeding in aquarium. They are both salt water and fresh water fish thriving best in the mixture of the above or in normal salty water. Adult mollies are usually between 2-4 inches(5 – 10 cm) long and they live around 3-5 years. Water pH should be around 7.5 – 8.5 and temperature 70°F – 82°F (21°C – 28°C). If i want to keep two dozen of mature molly fish in a tank how big a tank should be for them??? is tank size matter for that? ?